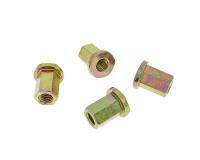 M8 threaded cylinder head nut, set of 4. 20mm long with collar. Suitable for all motorcycles, scooters and quads with M8 cylinder studs. The nuts can of course be used for other purposes.